We covered the news of the Retro Freak quite a while ago, and since then we've been waiting expectantly for more information about this potentially amazing system. 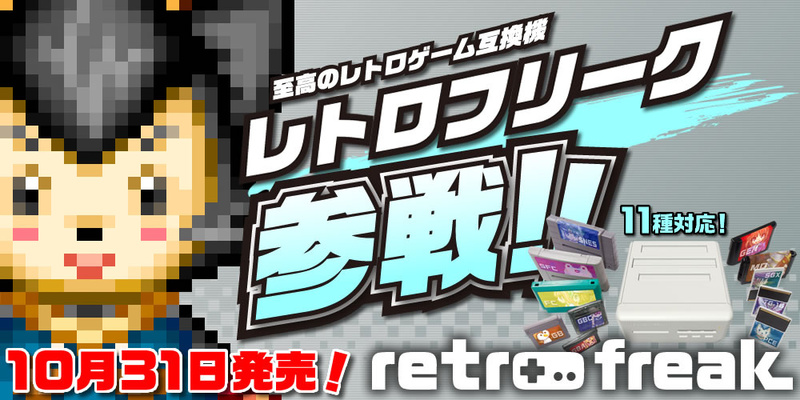 With support for 11 different consoles - Famicom, SNES/Super Famicom, Mega Drive/Genesis, PC Engine, TurboGrafx-16, Game Boy, Game Boy Advance, Game Boy Color, and Supergrafx - the Retro Freak can run ROMs and your original cartridges, and boasts HDMI output with 720p upscaling, as well as save states and screen filters. Retailer Play Asia has the standard system up for £111 / 154 Euros / $169.99, but a premium model - pricing still undecided - is available that comes with a controller adapter so you can use Famicom, Super Famicom, Sega Genesis, and TurboGrafx pads. Demand for the system has already been overwhelming, according to the retailer. We'll be reviewing this interesting rival to the Retron 5 in due course, but in the meantime, are you tempted to place an order? Let us know by posting a comment. This one is very, very interesting... I wonder if they will be distributed in Europe in some way... will wait for your review first. Is this wonder of a console even legal? If the price tag is reasonable, I will totes buy this. "Thanks for reaching out to us and for sharing your enthusiasm about the RetroN 5. As per an N64 compatible system, we currently do not have any news to share. Any new information regarding our current and future products will be posted here on our facebook page." Any chance you guys at NL could follow up with them? @Mogster I wouldn't be surprised if there's some legal thing where Nintendo has to leave the original content alone for a certain amount of time before they can use it. I'll wait and see how it fairs. That is way to much to dish out on a 'I hope it works like it says.'. @abe_hikura @Mogster I think there is some law like that yes. From what I understand the N64 us still patented. Plus N64 emulation is extremely difficult to do. I've never seen Goldeneye look good on an emulator. Nah, I'm not really interested. I prefer to own the actual consoles. @Snader According to someone who commented on the previous article, the Super Famicom and the Super Nintendo- have the same connectors, whereas the Famicom does not share one with the Nintendo-. This console, emphasising the Nipponese market, decided to focus on the Nipponese consoles. In other words, support of the Super Nintendo- was more or less an accident. I love the concept of a device that can play multiple systems relatively legally (I love my Retro Duo Portable with Genesis/MegaDrive and GBA adaptors), but it lies in the execution. Clone consoles have traditionally had a bunch of weird hiccups, especially with weirdly programmed software like Castlevania 3. I think I like the Retron 5 more than most people. It's a device that plays a bunch of retro systems and outputs through HDMI. I'm not pulling my TV out all the time to change out AV cords. And it supports save states. And it's easy to stream/capture Game Boy footage without the Super Game Boy or GBA Player's overlays. But the Retron 5 has got a really janky UI, feels cheaply manufactured (the packed-in controller is a POS and the plastic all around feels flimsy), and has questionable design decisions (why does the power button need to be held for 5-10 seconds to turn the system on - it makes me feel like the system's dead / why can I only have one cartridge in the system at a time - I want to put my SNES, Genesis, and GB Shaq Fu carts in at the same time). So I probably wouldn't get into the hype cycle for this one the way I did for the Retron 5. I'll remain cautiously optimistic, but it likely won't be a godsend. So it's just an emulator with IO for each console? Hmm. I guess it's good if you have a ton of games from each console and don't want to hook up each to your tv... Emulation though ew. Even though I've already invested in modding my SNES, I'm still tempted by this. Hopefully, the stock situation won't be as disastrous as the Retron 5 - I couldn't get one of those for love nor money. @Mogster N64 emulation is still pretty crappy, especially when not written by Nintendo itself (VC). @MarkyVigoroth The original Famicom used a unique port for expansion controllers, but the newer (AV) Famicom used the same ports as the NES (though without support for the Zapper, etc.) for the main controllers (though it has an original FC port on the side). Thus Famicom dogbones are the same as NES (though I assume the controller cord is significantly shorter). @KingMike I'm pretty sure he was referring to the cartridge connectors. The Famicom had a 60 pin cartridge, and the NES a 72 pin cartridge. Thus making the system physically incompatible with NES carts. Though I'm sure you could use an adapter with little issue. I only count 8 when barrimg the 3 region differences. So it can't play NES games? That seems like a strange design choice. That alone would push me to the Retron 5. I'd rather have NES compatibility than the PC Engine, Turbografx, and SuperGrafx. What I really want, though, is a Retron 5 with added N64 support. When that happens, I might finally buy one of these clone systems. I like this, there are a lot of decent PC Engine and Grafx games (good ol' hudson soft). I wouldn't mind the Retron 6 being able to host those games. Now I need a system that does all that, plus Neo Geo games, and we'd have an entire generation of consoles in one system. @Spin Let's throw in all Atari consoles (including Lynx), Game Gear, NGPC, and WonderSwan Color while we're at it! I was always under the assumption that Famicom controllers were hardwired, but upon seeing this article I did a quick search and learned something. Famicom controller ports look a lot like Neo Geo ports. @KingMike ...I was mentioning CARTRIDGE connectors, not CONTROLLER connectors. I'm interested, but I want to see how it performs first. @TrueWiiMaster Like the world needs another clone system that plays NES.